Space invaders needs no introduction - it defined the genre it helped create. As such original cabinets are treated as collectors items, increasing in value as the years go by. They require a special place in your heart, as the technology is over 30 years old and as such needs to be treated very gently as well as maintained. If you feel this calling in your heart to celebrate this great game, then Liberty Games can help you source an original cabinet as well as restore it to fully working condition. However for the vast majority of customers we would recommend one of our multi-games retro arcade machines - the ones listed below have Space Invaders on their games list (along with many many more). They use modern technology (whilst keeping the gameplay authentic) so will not let you down. With all the new technology that sprang up in the 60’s and 70’s, it was not uncommon to start wondering where all of this advancement will eventually lead us. It also made us think even deeper about whether there is another civilization out there that has the ability to travel to our humble planet in, according to novelist Douglas Adams, "the uncharted backwaters of the unfashionable end of the Western Spiral arm of our galaxy". If they do, we as a species at this point are most likely screwed. This decidedly negative thought process was not lost on game designer Tomohiro Nishikado, who, after dreaming about a group of schoolchildren being attacked by aliens while waiting for Santa Claus (true story), began creating custom hardware and development tools to help make the iconic Space Invaders a reality. Good thing too, because many would argue that the title is one of, if not the most, influential video game of all time. The premise is quite simple: take out the aliens before they reach the bottom of the screen. As for the mechanics, well, those were simple to, but keep in mind that this does not in any way mean it was easy (pretty much the rule of thumb for every other arcade game during that era). In short, a single player moves an armed 'base' left or right along the bottom of the screen and shoots the endless waves of aliens marching relentlessly down the screen towards earth. There are 48 aliens spaced apart into six columns in each stage of the game, with the player controlling the lone laser base as humanity's last line of defense. As more aliens are taken down, the invaders attack movement (along with the game's music) pick up pace. Defeating all of the on-screen aliens will bring another, more difficult, wave. This loop can continue indefinitely for those skilled enough. As one of the first "shooter" games ever released, this title was inspired by many other stalwarts of 70’s pop culture, including Breakout, Star Wars and The War of the Worlds. While it had many sources of inspiration, the game itself soon became hugely influential for many, many people, including current industry titans. Shigeru Miyamoto (creator of Donkey Kong, Mario and Zelda) considers Space Invaders to the MOST influential game of all time, and Metal Gear creator Hideo Kojima notes it as the title that got him interested in gaming. This is not all that surprising when you hear stories about the reception of Space Invaders and its effect on society. An urban legend states that the games popularity led to a coin shortage in Japan, along with many factual reports of adolescents robbing grocery stores so they would have money to play the game, including one crazy story of a Japanese girl caught stealing $5,000 from her parents in order to have unlimited lives at the arcade. Taito even went so far as to supply restaurants with sit down arcade cabinets after the owners complained that nobody was eating because they were too busy playing Space Invaders.This genius move by the developer actually helped to feed (pun intended) the popularity of the title. In fact, arcades in Japan were opened and operated solely for this game. 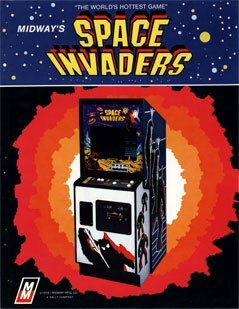 Space Invaders also has the notorious distinction of being (along with Pac-Man and Pong) the most pirated and bootlegged video game of all time. But that is a small price to pay for also being one of the most successful of all time. In fact, Space Invaders made three times as much in its heyday as the original Star Wars grossed at the box office. Now that’s a lot of quarters! !